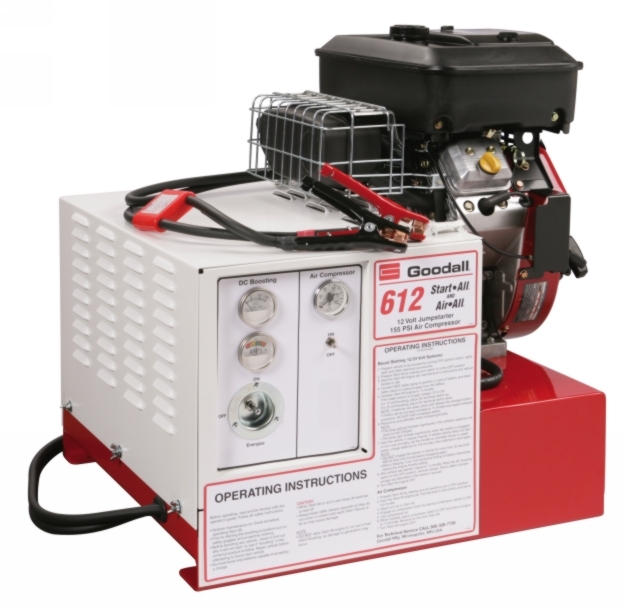 Goodall 700 Amp 12 Volt Start-All with 13 CFM 155 psi Air-All Air Compressor is perfect for starting any 12 volt vehicle up to and including seni-tractors. Unit includes volt and amp meter to monitor boosting output. Voltage is regulated to protect on-board electronics. AntiZap Surge Protection for safer boosting. 30' of 1/0-gauge welding cable allows convenient access to vehicles. Electric start Briggs & Stratton Vanguard OHV V Twin Engine with full pressure lube, external oil filter and low oil shutdown. Dimensions are 31" L x 25" W x 29" H. Weight is 465 lbs. Air tanks sold separately.